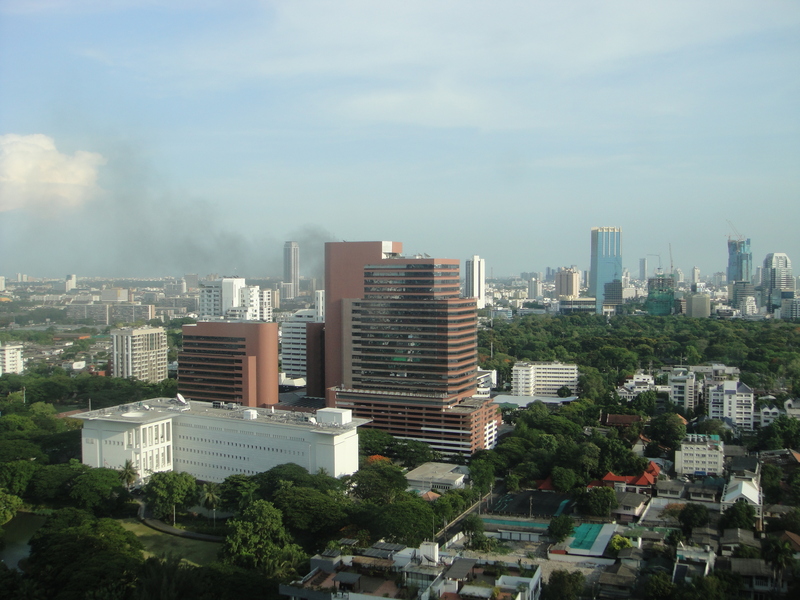 Gunfire, grenade explosions and thick black smoke were the theme of the day as the heavy fighting was taking place just past Lumpini park toward the Sathorn area and on Wireless road. Wireless road is the location of many of the embassy’s and is now the key to this battle, if the government can gain access to this road they have a clear shot to divide the protest site in the middle (the area the red shirts control is shaped like a rectangle). I live in the red shirt controlled area; oddly enough it is very safe as the fight is not over this area. It is not safe in the areas immediately outside of red shirt control as the government is working to contain the red shirts while the red shirts are making raids outside of the area to attempt the government from pushing forward. 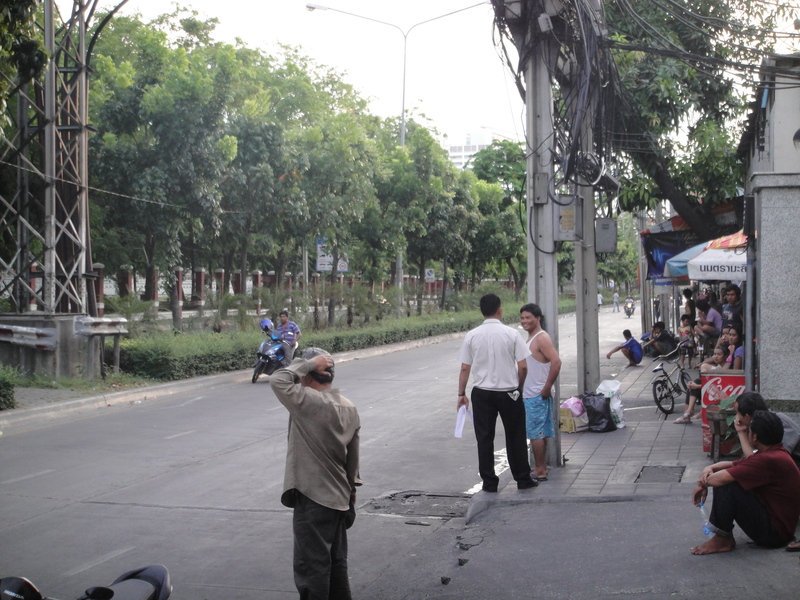 Behind the red shirt blockade- Thai residents staring at Lumpini park, waiting for the military and the "big" fight? Urban warfare, the streets are deserted, major thoroughfares are completely empty, just waiting. Reports state 22 dead and over 140 injured. The government is taking an aggressive stance and is winning. The red shirts leaders ask for a cease-fire, at the same time while calling for my supports to join their cause and vowing to fight until the end. I saw red shirts making hundreds of Molotov cocktails. 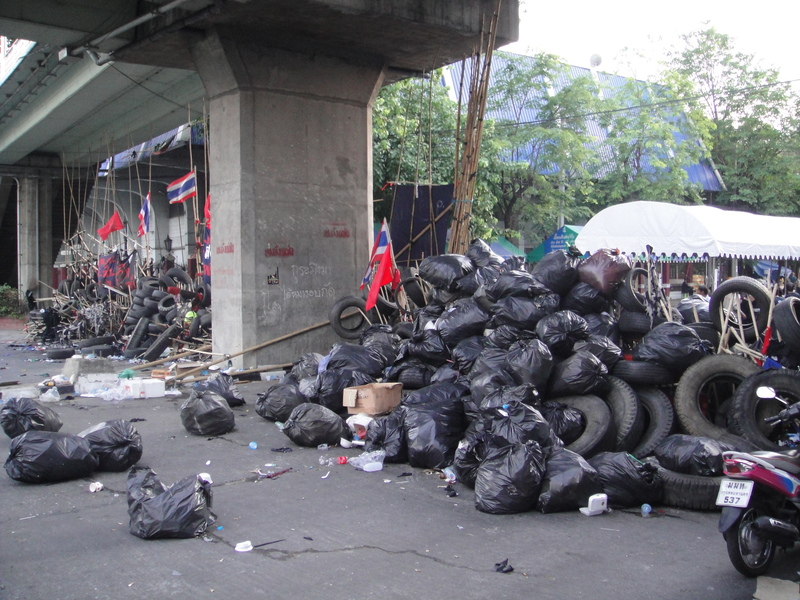 The red shirts are running out of food, stealing from those crossing barricades. The red shirts have blockaded my street, it is empty and all shops are closed. I walked just over 1k to the nearest grocery store only to have the red shirts confiscate everything I bought as they patted me down when I crossed the barricade. They took my phone, which I regained after a good bit of yelling and some pushing. I went on my normal Saturday morning run with a defiant Thai friend “red shirts cannot stop Thai people from living”, he is in his mid fifties and is everything that is wonderful about Thai people. We usually run in Lumpini Park, instead we ran by and just ran around on the streets. 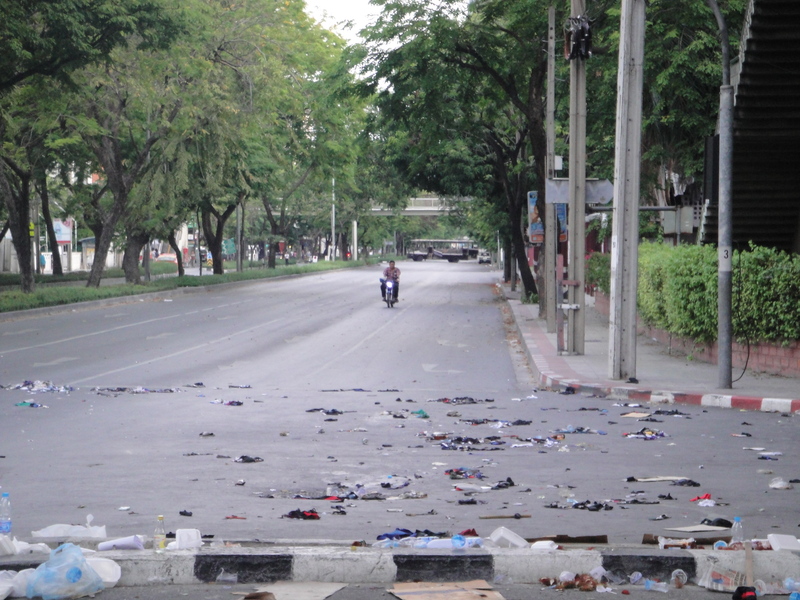 Lumpini is a true war zone, burned out bus, glass everywhere, bullet casing, blood in the street. The military checkpoints are now significant and in effective, day and night. The checkpoints surround the protest area; any Thai person entering must show their ID and have it documented along with the license plate of their car and why they want to pass through the military blockade. This takes around 30 minutes- a person must exit their car, fill out the forms, be granted permission and can then pass through the checkpoint. The government has also taken up the public relations fight, saying they offered the red shirts the deal they wanted but the red shirts didn’t leave due to personal greed and lack of amnesty for their leaders. Saturday night the government announced on television that the military operations would continue to eliminate the terrorist elements from the streets- not the red shirts- but the heavily armed members of their group. Sunday promises to be a long day. This entry was posted in Bangkok, Culture, Landmark, Politics, Thailand and tagged bangkok fighting, is bangkok safe, red shirts, Red Shirts in Bangkok, travel to bangkok May 2010. Bookmark the permalink.